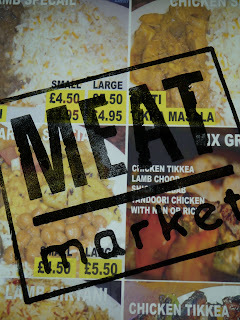 MEATmarket is located in a galley space above the knick and knack of the "antique" souvenir sellers in the Jubilee Market Hall, on the south side of the Covent Garden piazza. The entrance is on Tavistock Street, wedged between Wagamama and the dodgy-looking Italian place. Once you get up the stairs and past the sign forbidding you to queue jump in various languages, it's a simple case of ordering as you enter before shuffling along to pick up your food or wait for your name to be called. It's a relaxed, light area with room for a few high tables. There's also no wall between the flipping burgers and the market folk below so the beats and tunes fill the air. We hit up MEATmarket on the day after it opened for a spot of Saturday lunch and didn't need to wait to order or to grab a table (take that verboten sign!) We were served by the lovely Zoe who said that on Day 1 there were crowds snaking out the door, down the stairs and out onto the street. Maybe that was because the crappy weather wasn't the best for a takeaway. Still, the set up at MEATmarket encourages a fast experience, although all the patties are still cooked to order. The menu is stripped down from the one at MEATliquor with just four burgers to choose from in addition to three hot dogs, a few sides and a couple of desserts. We ordered a Dead Hippy (two beef patties, lettuce, cheese, pickles, minced onion, dead hippy sauce) and a Black Palace burger (two beef patties, cheese, pickles, grilled onion, ketchup, mustard) with fries. The Dead Hippy is a favourite at MEATliquor but the Black Palace is a new one created for MEATmarket. What's there to say about the burgers in the MEAT family? These are not anodyne, standardised burgers. These are big flavoured finger lickers and a dead cert for one of the best in London. They're certainly not for the timid or faint-hearted as you'll end up with a fair amount of it on your face and on your hands. At £7.50 each, they're also reasonably priced. Feeling content after devouring the Dead Hippy and the Black Palace, but wanting to be thorough, we ordered the Ripper hot dog as a chaser. Although there will be three dogs to choose from, only the Ripper was available on Day 2. The Ripper is a Danish style hot dog taken to the nth degree. It was gilded with a salty bacon wrapping and topped with minced white onion, pickles and gooey cheese. But lurking beneath the heavyweight topping was a kicking chilli relish which really made you sit up, roll over and beg all at once. This was not like any dog I've eaten on the streets of Copenhagen. It's very sad I know, but I was excited to see that MEATmarket is offering milkshakes, which I wish were on the menu at MEATliquor. To me, burgers and shakes are just meant to go together, which is part of the reason why I like Shake Shack in NYC so much. I once went to a conference located right next to a Shake Shack and instead of eating the freebie food on offer, I nipped out for my daily cheeseburger and choc shake fill. To be fair though, the clue to the beverage-focus at MEATliquor is in its name. True to form however, the milkshakes at 'market come with a twist - a hard or a soft one. Zoe asked if we knew the difference between the two, and while having an inkling, we let her explain. Soft is basically just a delicious vanilla thickshake - no strawberry or chocolate here thank you very much. The hard version comes with a welcome slug of liquor. We chose a delicious bourbon combo. Word of warning - make sure the kids know what they're getting before they order, or you could all be in for a surprise. We didn't linger for dessert but the ice cream and Jagermeister sounds interesting, although after my last work Christmas party I'm rather more wary about Jager than I used to be. 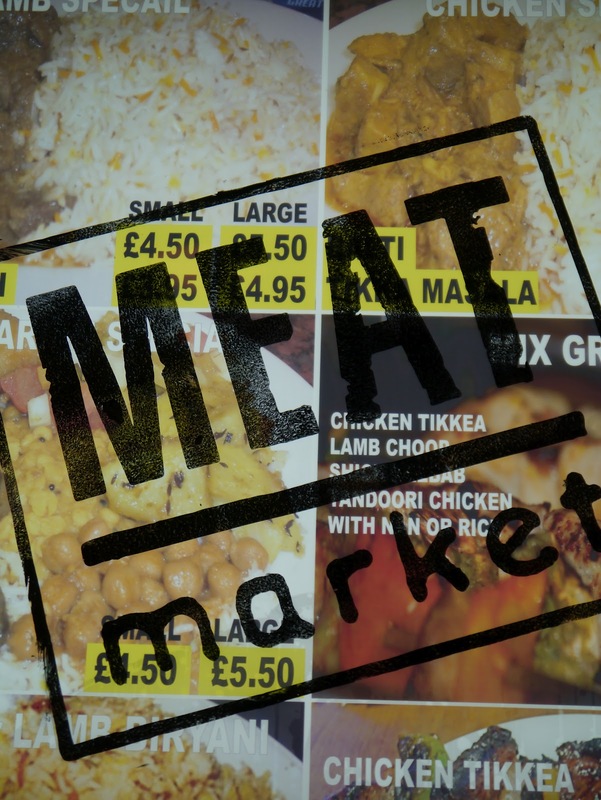 So for my money, MEATmarket improves on the MEATliquor experience by stripping it back to the bare bones and making it more accessible. There's enough on the menu to warrant repeat visits and come summer time (we live in hope) this place will be a handy standby in the West End.